Home / What is a Saree? A saree is a female garment that consists of a rectangular piece of fabric with a length varying from 5 to 9 yards (4.5 metres to 8 metres) and width varying from 2 to 4 feet (60 cm to 1.20 m). It is typically wrapped around the waist, with one end draped over the shoulder, baring the midriff. 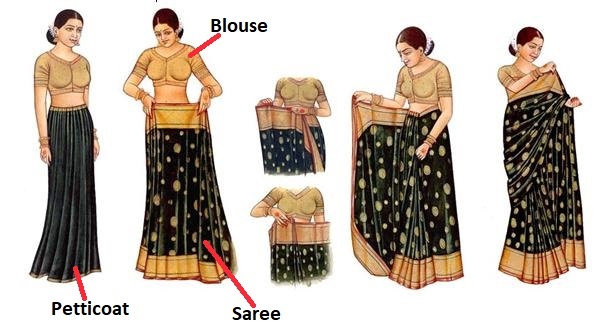 The saree can be draped in various styles. The saree is widely regarded as a symbol of grace in cultures of the Indian subcontinent. The saree is usually worn over a petticoat and with a fitted upper garment commonly called a blouse. The saree fabric usually comes with an extension of material on one end that can be used to sew a blouse, or a blouse can be bought ready-made if desired. All sarees sold on this website will fit all adults. Saree Draping Service – if you are not confident to drape yourself then I have a saree draping service available. How to Drape a Saree – videos to show you how to drape a saree by yourself.